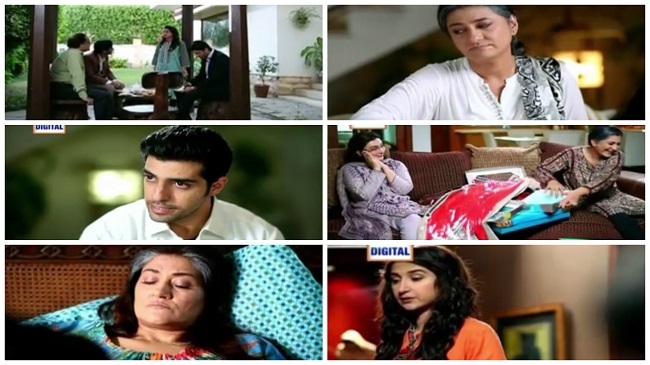 Although this episode of Khuda Mera Bhi Hai was slightly better but the fact is that there is nothing much to explore in any of the tracks now and the drama should come to an end soon. Noor became a parent in this episode, Sanam probably took the first major step towards bringing about the drastic change in Arshi and Zain, and Kashmala revealed her true feelings. I must say that Kashmala’s feelings were covered in a much better way than all the other tracks. This track definitely has the surprise factor and her attitude made a lot more sense when she confessed that she was doing all this on purpose. Noor’s reaction to Sona’s death and many of the conversations later on made it sound like all these people saw this tragedy as a blessing in disguise! Although, I am certain that the writer did not want to convey this message but the dialogues definitely gave the wrong message! Also, no one talked about reporting this incident to the police or about catching the perpetrators. It was definitely good watching Noor accept and love a child like that and watching him give a child an identity was touching but it would have been so much better if a central character was not brutally killed by the writer in order to give this ‘gift’ to Noor. Mahi’s nikkah got delayed yet again and she finally decided to visit the doctor! I would be terribly disappointed if she has some fatal illness because those viewers who have been watching Mahi go through hell for the longest time now deserve better. Also, so far this drama has broken a lot of stereotypes and showing Mahi getting married to Mikael and living a happy life would be far more novel than showing her dying of all the stress she took her whole life. A woman like Mahi should be celebrated but if she dies then the writer will be asking the viewers to feel sorry for her, which would be clichéd! One of the best moments in this drama was Mahi and her mother sharing a laugh! It was a nice break from watching these characters sacrificing or suffering! Sanam’s conversation with Zain suggested that Zain might just accept Noor at some point, I hope it happens soon! I must say that Sanam’s character has to be one of the most steady and positive characters in this play. Mariam Saleem has brought out the best in her character, her dialogue delivery and body language has always been on point. The scene in which Sanam and Arshi were strolling by the poolside was hilarious because that was the most inappropriate place for someone in Arshi’s condition to walk! This episode would have been far more impactful if the dialogues were more relevant and powerful. The drama needs to end soon because the slow pace of the drama is the main reason why it does not give you a lot to look forward to. Khuda Mera Bhi Hai has served its purpose therefore dragging the drama now is simply putting those viewers off who enjoyed the drama for 15+ weeks.